When the weather is cold, you'll always be in the mood for a hot drink. 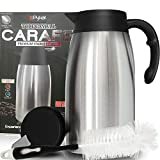 You can find a big selection of thermal beverage dispensers, or thermal carafes, that are specially made to keep drinks hot for a long time--as much as 24 hours. Like a thermos, they employ two containers with a vacuum or air gap in between, that keeps the heat from leaking out. But they have the advantage that they have a specially constructed spout for pouring. 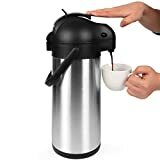 If you have a coffee maker that makes 12 or more cups of coffee, you can use a thermal beverage dispenser to keep the coffee hot over the entire day. 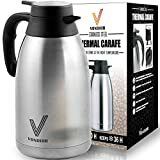 And if you're interested in something that looks stylish, you can get a thermal carafe that is impressive enough to be used in a high-class restaurant. You can choose from getting a dispenser in the form of a decanter, or a airpot (where you press on a plunger to get the liquid out). 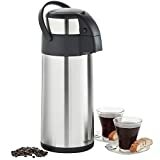 Stainless steel vacuum container: These models are typically more expensive, but they have the advantages of portability (there is no chance that they’ll break, so you can take them with you wherever you go), and also that they keep coffee or tea hot for a long time. 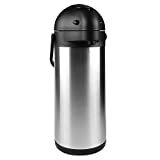 But some detect a metallic taste in hot drinks stored in a stainless steel carafe. 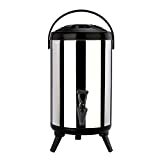 Glass-lined: These are less expensive, but they will not keep a drink hot as long as the stainless steel vacuum model. They will hold in the heat for maybe 3-4 hours, instead of 12 hours as with the steel container. Glass also has the advantage that it will not affect the taste of the coffee. Glass-lined vacuum container: Some carafes are made with a glass inner lining, surrounded by a vacuum, and a plastic outer cup. This will have the advantages of keeping drinks hot a long time, like the stainless steel vacuum container model, and they will also tend to be less expensive (glass as being cheaper than stainless steel). 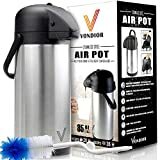 Advantages of airpot: People mentioned that an airpot is preferable around children or elderly people: they won’t have to lift the container in order to extract the hot drink. Special cleaning brush: Many thermal beverage dispensers are supplied with a cleaning brush. Since you put other liquids in a carafe besides just water, it’s necessary to clean it out with a brush from time to time. The Cozyna Thermal Coffee Carafe comes with such a brush, to assist you in cleaning the dispenser. Capacity: One factor that you take into consideration when buying a thermal beverage dispenser is the capacity. If you buy a unit that holds 2 or more liters, you might find that the beverage loses heat rather quickly if you don’t fill it to the top. If you don’t think you’ll need to serve a large quantity of hot drinks, consider getting a smaller unit, that you can fill to the top. That way, the beverage will stay hot longer. Airpot: The airpot (or “push pot”) is a type of thermal beverage dispenser where there is a pump to get the liquid out of the dispenser. This is somewhat safer than a dispenser where you have to pour the liquid--there is less chance of scalding yourself with the hot water, or spilling it. Zojirushi makes a 3-liter airpot--it gives you both advantages: 1) you don’t have to lift the dispenser to pour it, and yet you are able to fill it to a large capacity. Update International--are makers of thousands of kitchen and dining products. They make spatulas, coffee urns, decanters, pots, mixing spoons, and much more. Their large capacity air pot has a glass liner and is vacuum-insulated. MyGift--MyGift are retailers of a number of products for the home and kitchen. They make thermal carafes for coffee, tea and water. Their thermal carafe holds 2 liters and comes in a variety of colors. Cresimo--are makers of a number of kitchen utensils and products. They make cooking torches, corkscrews, cocktail shakers, thermal carafes, and bar sets. Their carafe can keep beverages hot for 12 hours, or keep them cold for 24 hours. Their carafe has a wide mouth, and is convenient enough that it can be poured with one hand. Cozyna--are makers of French press coffee equipment and coffee grinders, kettles and teapots, carafes, milk frothers, air fryers, and more. 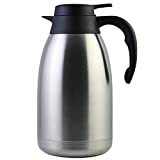 Their thermal coffee carafe has double wall vacuum insulation to keep drinks hot or cold up to 24 hours. It also has a locking mechanism so that you can pour it with one hand, and a rubber base to prevent the carafe from slipping and spilling. Zojirushi--was founded in 1918 in Osaka, Japan as the Ichikawa Brothers Trading Company. Their first product was a glass-lined vacuum bottle, using vacuum insulation technology in household products. They also make rice cookers, food and beverage preparation appliances, water boilers, beverage dispensers, and many types of vacuum bottles.